If there were any doubts as to whether or not Justin "Zeejustin" Bonomo was a well-rounded poker player, this should eliminate them. Bonomo finished in second place at the 2007 WSOPC $3k buyin event, taking home about $51k after a chop with Hae Cheong who ended up taking second place. 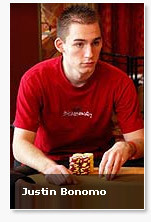 There is no question that "zeejustin" is a tremendous No Limit Hold'em player, but little did everyone know that Bonomo was actually a well-rounded player, knowing the games of Razz, Omaha 8 or Better and Limit Hold'em, to mention a few. Zeejustin continues his hot streak, as he has piled up over $500k in cashes in the past few months. Zeejustin, banned from most popular online poker sites for multi-accounting, is now focusing his game on live play, and the results seem to be paying off for him. Not only that, but after the first day of play, Justin Bonomo is near the top of the leaderboard of the WSOP Circuit main event, following a high finish at the WPT Championships. Quite the year for Mr. Bonomo.